These days, it's all but de rigeur that concept cars from major global automakers be shown with some form of alternative propulsion. 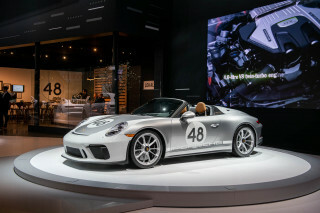 They may preview future production vehicles powered by plain old conventional gasoline engines, but a plug-in hybrid or other greener powertrain shows the automaker is forward-looking. Is that the case for the Genesis GV80 fuel-cell concept utility vehicle that debuted yesterday afternoon at the 2017 New York auto show? 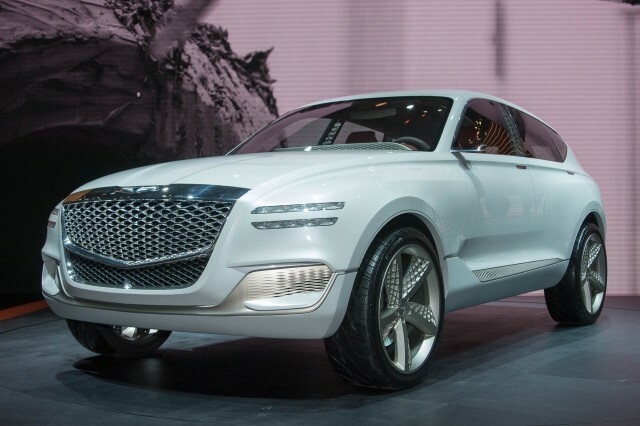 Industry sources suggest that the vehicle itself previews an upcoming mid-size SUV from Hyundai's luxury brand. It also expands on the naming strategy for Genesis models: the “G” represents the Genesis brand, while the “V” denotes the extra versatility of an SUV, and the “80” indicates the vehicle's position lineup. Genesis plans a six-vehicle lineup by the end of 2020, and it has said two of those will be crossover SUVs. The first of those is previewed by the New York concept car, which roughly targets the BMW X5. The second is expected to be smaller, aimed at the BMW X3. Genesis executive Manfred Fitzgerald said the production model previewed by the GV80 Concept will arrive within two years. The concept car expands on the brand's "athletic elegance" philosophy, adapting it from sedans to the first SUV design seen from the newly standalone Genesis brand. 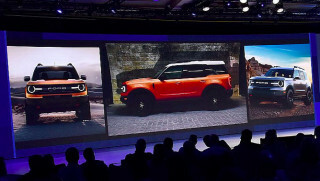 How much of the concept's styling transfers into production remains to be seen, though in general vehicles like this tend to be lightly disguised versions of future models. The SUV leads off with the Genesis "crest" grille, featuring a diamond pattern, flanked by split LED headlights—which Genesis calls "quad lamps" and says will be a signature of future vehicles. The structural-truss design for the roof pillars can be seen from inside the vehicle, an unusual element that underscores the engineering prowess Genesis hopes to provide. The interior features an open design and is dominated by a 22-inch curved display at the top of the dash. A second screen connected to it forms the main instrument cluster. Two distinct zones on the display separate information targeted to the driver and the front-seat passenger. In its press materials, Genesis indicated that the GV80 concept is powered by a fuel cell—but released no other details. Still, that piece of information is worth a second look. Hyundai has said it plans to release a dedicated crossover design for its next fuel-cell vehicle, which succeeds the low-volume Hyundai Tucson Fuel Cell, adapted from the last generation of the Tucson compact crossover. Meanwhile, Toyota's luxury division Lexus has indicated that it expects to release a hydrogen-powered sedan, likely based on its latest LS full-size luxury flagship, by 2020. And Genesis is following the Lexus playbook of 20 years ago, launching in North America with a brand identity based on comfortable, quiet luxury and a full set of features at a price below competing vehicles in the premium/luxury segment. 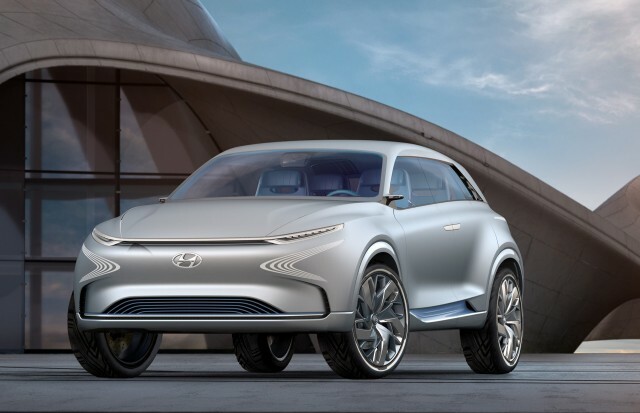 Hydrogen fuel-cell powertrains remain expensive to build and produce, and Hyundai-Kia (unlike Toyota) is following parallel tracks in offering both fuel-cell and battery-electric vehicles. But with SUVs the global growth segment, and higher-priced luxury vehicles more easily able to absorb the expense of fuel-cell powertrains, would it make sense for Genesis to combine the two? That might give the Korean luxury brand a unique entrant into what's now a small segment—and a way to distinguish itself in an ever more-competitive luxury field.